Some 600,000 poor women and children will no longer get free milk and cheese, and some 2,100 fewer food inspections will take place if federal budget cuts expected to kick in March 1 actually take place. The White House warned Friday that some $85 billion in budget cuts coming as a part of the "sequester" will end up carving some 9% from non-defense programs and 13% from defense programs, because the cuts take place over 7 months instead of 12. The cuts are a part of a larger effort to trim $1.2 trillion from federal deficits over ten years. "These are large and arbitrary cuts, and will have severe impacts across government," said Danny Werfel, federal controller of the Office of Management and Budget. The White House budget office had been mum on how the cuts would fall. But last week, federal agencies notified hundreds of thousands of federal workers that furloughs could be around the corner, Werfel said. The memo wasn't the official 30-day notice required by federal law, but Werfel suggested that could be coming. President Obama this week started pushing Congress to delay the cuts by a few months, allowing time to pass a more comprehensive new budget that both cuts expenses and hikes taxes. House Republicans say they also don't want the sequester to happen, but they note they've passed legislation that would replace it "with common sense cuts and reforms," specifically to mandatory spending programs like Social Security and Medicare. Agencies have been providing the White House different tallies of how they'd carry out budget cuts, which the administration is using to push for what it calls a "more balanced" approach. -- 70,000 children would get kicked out of early childhood intervention programs that help poorer children catch up to middle-class peers, heading into kindergarten. -- 1,000 fewer criminals would be prosecuted due to furloughed federal prosecutors. 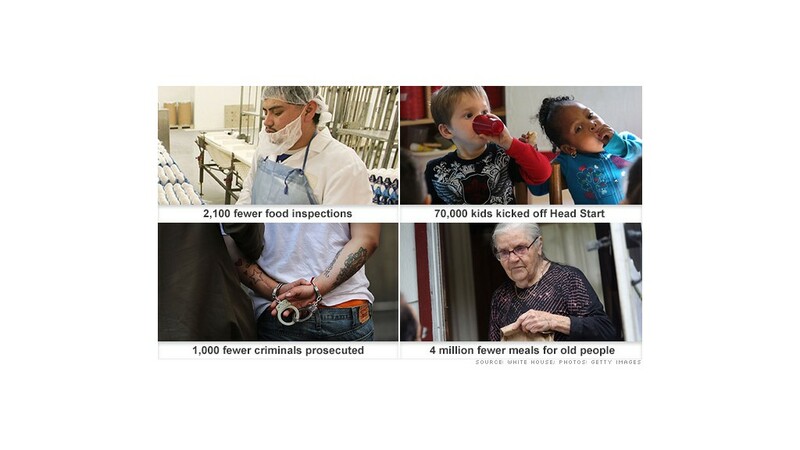 -- 4 million fewer "Meals on Wheels" would be delivered to the elderly. -- 1,000 fewer research grants would be awarded, cutting research and laboratories for some 12,000 scientists and students. If the sequester takes effect, economic growth will slow. By some estimates, up to 1 million jobs will be lost. Federal workers will be furloughed, and a bevy of programs and services across the government will be curtailed. House Republicans want to replace the defense cuts with more nondefense cuts, something Democrats reject. Democrats want to replace the cuts with a mix of more targeted cuts and tax increases; Republicans reject the tax hikes. "We're glad they're laying out the devastating consequences of the president's sequester, but the question remains: What are they willing to do to prevent it?" said Brendan Buck, spokesman for House Speaker John Boehner. Though lawmakers agree the sequester is a terrible idea, many think it might be preferable to cutting a new deal they like even less. Entitlements such as Medicare, Medicaid and Social Security, which fall under mandatory spending, would be largely protected from the cuts. Are you a parent with a child in a Head Start early childhood education program? E-mail us and your story might be included in our coverage about budget cuts to federal programs.